Happy day after Star Wars Day! For a good part of my celebration I found myself in deep consideration. Now, before you jump to conclusions, I am playing the role of a scientist for the purpose of this article. I am asking the questions. Lots of questions. I simply am curious and I think you should be too. Whenever we hear about the Dark Side it is either from the perspective of the mentor (another Jedi) teaching their padawan what to steer clear of or from the perspective of the Sith, whom we have early on deemed the "bad guy," in the present version of our hero's story. But have you ever received an in-depth look at what 'works' and has 'worked' for ages about the Dark Side from a Sith or Dark Jedi or Nightsister or any of the other hundreds of practitioners of this side of the Force? I have never spoken with any of them personally, but by employing my empathy (a skill I can say I have mastered during my many years of practicing the Light Side of the Force), I can imagine they would say the Dark Side gives them passion, strength, power. The Force frees them. What is so wrong with that? What one does with that freedom; there inlies the problem...potentially. According to one infamous, green Master, the Light Side breeds peace and passivity. "How am I to know the good side from the bad?" "You will know when you are calm. At peace, passive." 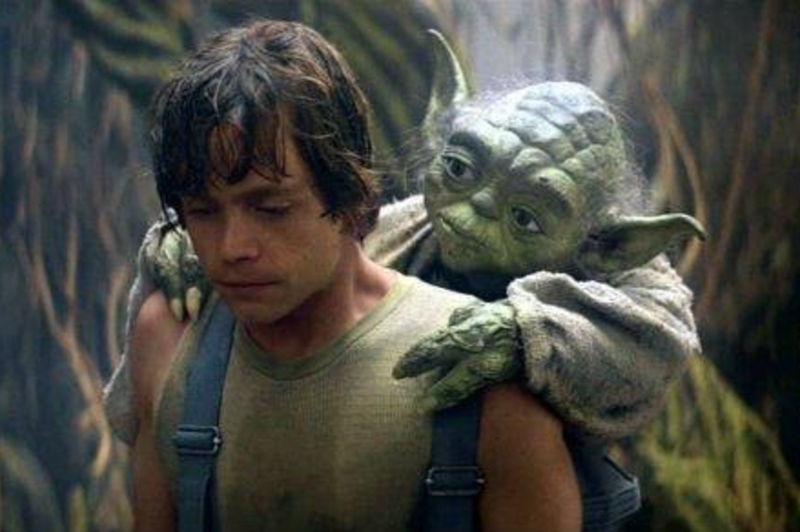 -Luke and Yoda. See? His words exactly. Which is still strange to me, because the Jedi turn to violence and wield lightsabers to "keep the peace" when their well-trained persuasion tactics (a.k.a. Jedi Mind Tricks) and powers of telekinesis fail to deliver ( I know, I know, they will always make an attempt to incapacitate rather than kill, but doesn't that almost always backfire in the movies?) That, or they send in their clone armies to 'pew-pew-pew' away. Where the Jedi see the Force as fire, passing it from one user's lit torch to another's and another's, the Sith see the Force as venom that becomes diluted every time it is poured from one cup to the next (hence, the Rule of Two). But I'd be willing to bet they agree that the Force surrounds us and binds us together, "us" being everything 'alive' and 'not alive' in the Universe. What if we are not supposed to choose one side over the other? What if the more wholesome and true use of the Force is a balance, like yin and yang? Anima and Animus. A better understanding of the Force could be used in more superior ways like folding space and time (maybe using alchemy in a thorough study of midi-chlorians....but that's for another topic....I digress)! The possibilities are endless and exciting! Neither side is perfect and certainly both sides have their ever so popular extremists. But I believe there can be an all powerful middle. This is why recently I have been giving more consideration to the Dark Side. Older PostBooze-less for 30 DAYS!